That’s the word I would use to describe Batman: The Dark Knight–Master Race. I mean this both literally and thematically. From a literal standpoint, Master Race undoes the travesty of Batman: The Dark Knight Strikes Again. Of course, these are both sequels to the seminal Batman: The Dark Knight Returns. Master Race is the first Batman book I’ve read in quite a while that kept me turning the pages. When I had to put it down, I couldn’t wait to pick it back up. Some say that The Dark Knight Returns helped to usher in the Dark Age of comics. It played a role in taking Batman back to his dark roots, establishing a general psychosis to the character, and promoting the idea that Batman and Superman would be anything but super friends. It’s impact can be felt even to this day. The Dark Knight Strikes Again was just a hot mess. I haven’t read it in a long time, but I remember feeling that it had nothing in common with its predecessor and seemed intent on being as crazy as possible even at the sacrifice of plot, character, good taste, and logic. Master Race takes the best aspects of both books, blends them together, and churns out an incredibly satisfying read. Carrie Kelley, the young girl who took on Robin’s mantle back in The Dark Knight Returns, is front and center in this book. The Dark Knight Strikes Again brought Superman’s daughter Lara into the fold, as well as Wonder Woman, the Flash, Green Lantern, Hawkboy and Hawkgirl, Atom–all of whom reappear in Master Race. This time, though, they are treated with depth and care. In fact, some would say they are all actually redeemed. Master Race redeems every single character in its pages. They each go through a personal journey, and they each come out better for it. I don’t want to get into the particulars due to revealing too much plot, but this book made me look at these characters as heroes again. Redemption strikes me as a theme of the book. Which is probably the most ironic thing ever. Master Race also, in my eyes, redeems Frank Miller. Frank Miller is a gifted writer and artist–he proved that on books like The Dark Knight Returns, Daredevil, Batman: Year One, and the first Wolverine miniseries. Unfortunately, his work on The Dark Knight Strikes Again made me question both his talent and character. That book seemed like a total cash grab. It almost acted like it wanted to make a point to the reader–that the comic fan will buy anything if there’s enough hype surrounding it. It definitely turned me off from Miller for a while. So why did I return for Master Race? Brian Azzarello. I’ll read anything that man writes. I knew that if he played a hand in Master Race, it would be worth my time to check it out. I’m so glad I did. I have no idea as to the politics of Azzarello teaming up with Miller, but if DC made it happen to ease fan apprehension, it worked like a charm on me. It’s so ironic that two men who are known for grim and gritty, hard-boiled writing provided one of the most inspiring Batman stories that I’ve ever read. As much as The Dark Knight Returns created a Dark Age, I could see Master Race igniting a Heroic Age. It truly counteracted all of the negativity surrounding our society at the moment. 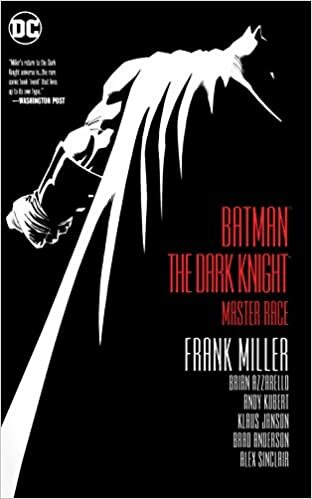 Maybe you’ll agree with me, maybe you won’t, but I definitely recommend you read Batman: The Dark Knight–Master Race and see for yourself. This entry was posted in Book Reviews and tagged andy kubert, art, Batman, brian azzarello, comic books, DC Comics, entertainment, frank miller, master race.